Reason: Lots of people in Haiti need a JOB... So why not help them and help ourselves in the process? In Haiti, there are A LOT of people doing NOTHING... Every day... So why don't we start thinking of ways to hire family and friends to work for us instead of handing them a fish (give/transfer money) every time they need it? Instead, I would like to give them something to do, something small, something with a very low start-up cost but with a decent profit margin. Each person has to be able to give back the capital investment and a share of the profits. After all this is an investment and NOT a gift. I also need to use that same capital, and the Return on Investment (ROI), to help more people. SO... What kind of business can you think of that you can start in Haiti for $500 U.S. or less that you could hire someone to run for you for a share of the profits? The training necessary to run and operate, grow and expand a business is not a natural thing for the people that have been sitting and there is little training for them. Installing rain gutters and water tanks for homes so people don't have to walk so far to get water for everyday tasks. Cooking, bathing, washing hands, washing clothes. Maybe a chicken farm and sell eggs and chickens. I have some ideas, good Ideas i believe. However I need to know more before revealing them. 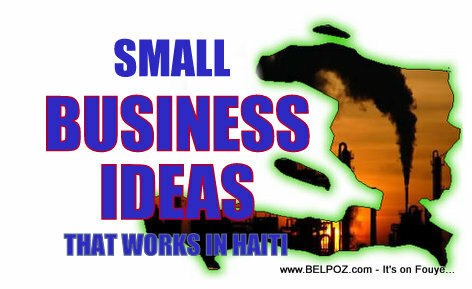 What do you plan to do with those Ideas for small Businesses? Do you have any potential financial backers? Do you have a goal or a plan? What do you see as your role in this activity? I recently returned from Haiti and one of many things that can be started for a small amount of money, surprisingly is road repair. Not the big scale stuff, but the little maintenance stuff like fixing potholes. This would be a startup sponsored through the mayors office in each town. The process involves a team of three laborers, one to collect a city authorized fee from each vehicle passing by the repair site. The other two would do the the work. Just stumbled upon this article for my research. Did you find an accountant in Haiti, yet? I have one that I can recommend. I wrote an eBook that you can buy from my website 1haitian1project.com using paypal. I outline - in the eBook - a business you can start from scratch with sales from day one. It is a canteen. A canteen is a cafeteria.